These breakout boards bring all 44 pins plus shield of a DB44HD (high density) connector out to screw terminal blocks, allowing simple and quick connections for prototypes or permanent installations. These breakout boards are perfect for field wiring tasks and are available in two different connector hardware options: captive screws or jack screws. The jack screws work well when mounting the breakout board to a wall box plate or thin panel that has a DSUB cutout; the captive screws provide a convenient connection to a mating connector that already has jack screws. See the Connector Hardware Options section below for more details. The small footprint means that the end profile of the breakout board is no wider than the connector itself. This can be important for installations where equipment contains multiple connectors which are spaced closely together. Even in this restricted space, these slim breakout boards can still be mounted directly to the equipment without using extension cables. Although the breakout board footprint is small, provision for strain reliefs has been included; holes drilled in the board provide anchor points where tie-wraps can be attached. 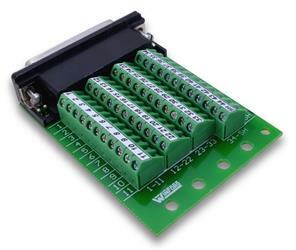 For larger DB44HD breakout boards that include a prototyping area, mounting holes, and DIN rail mounting options, please click here. These break out boards are perfect for production applications as well as for experimentation and prototype work. 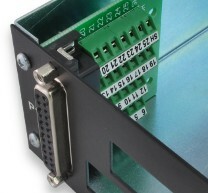 They are well-suited for interfacing with data acquisition equipment or any other devices that use a DB-44HD connector. A breakout board is sometimes referred to as a "transition module", "terminal board", "terminal block", "breakout box", "breakout adapter", "terminator", or "interface module". Approximate dimensions: 2.75" x 2.09"